Transport on the main coastal road between Kalmunai and Batticaloa resumed Monday, almost a month after the Tsunami ripped off sections of two causeways in Kallar, 28 kilometres south of the eastern town. The main gap in the Ondaatchi Madam-koddaikallar Causeway was spanned by a temporary bridge by the Road Development Authority (RDA). 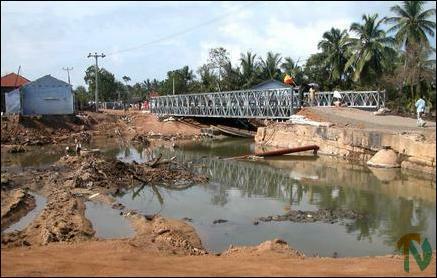 “The Sri Lankan government has to come up with big money to really repair this causeway. Otherwise this vital part of our district’s infrastructure would be damaged permanently”, an RDA engineer in Batticaloa told TamilNet. The other two segments of the Koddaikallar and Periyakallar causeways which were ripped out by speeding waves of the Tsunami have been patched up with sand and small pieces of granite. Koddaikallar is an island in the lagoon twenty eight kilometres south of Batticaloa on the main coastal road that links all the main towns and villages on the eastern and southeastern coast. It is connected by two causeways on its north and south. The causeway on the southern side is known as the Periyakallar Causeway. A narrow stretch of the lagoon between the estuaries facing the causeways separates Koddaikallar from the sea. The December 26 Tsunami ripped off chunks of the two causeways in four places and flattened almost all buildings on the eastern part of Koddaikallar. Power lines were knocked down but electricity was restored last week on 19 January. Telephones are still dead. All traffic on the busy coastal road was blocked until Sunday. Vehicles had to take a long detour, crossing the lagoon at Paddiruppu and then again at Kittangi near Kalmunai. Buses and vans for the public ran in two segments- one from Batticaloa town to Ondaatchi Madam and the other from Koddaikallar to Kalmunai. Passengers had to walk over the patched parts of the causeway from Onddatchi Madam to Koddaikallar to board another bus to Kalmunai and vice versa. The RDA engineer, speaking to TamilNet on condition of anonymity said that the gaps in the causeway should be repaired on a permanent basis as soon as possible before the next monsoon rains. Three of the four gaps in the twin Kallar causeways have been filled temporarily. “The east coast’s infrastructure was much destroyed by the war over twenty years. 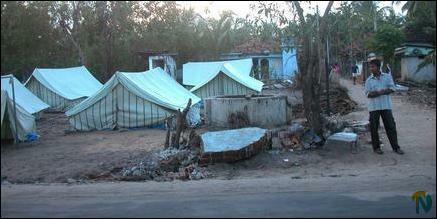 The Sri Lankan government has done little to improve it after the ceasefire. The infrastructure here has been further battered by the Tsunami. If Colombo continues to be negligent and conveniently forgets these parts in the coming months, Batticaloa and the coastal region of Amparai would be fall into ruin soon”, said Mr. S. Jeyanandamoorthy, Tamil National Alliance MP for Batticaloa. The twin Kallar causeways in the southern estuary of the Batticaloa lagoon was originally built by the Dutch in the eighteenth century with limestone and coral rocks .